“Nor was Colman VonKeviczky at all shy in confronting anyone about his views. Colman was a prominent member of the Hungarian-American community and was once part of a delegation that attended a briefing organized by the Reagan White House at the adjacent Old Executive House. When the president’s science advisor George Keyworth was explaining the SDI research program, Colman pointed out with that roaring voice he had that ‘star wars’ was really aimed against the galactic forces and not the Soviets. The science advisor was not pleased. Following the briefing VonKeviczky went to the Keyworth office where he presented a written brief titled “Heed Memorandum for Action to the 99th Congress.” The briefing described the problems VonKeviczky saw with what he called the UFO Defense Initiative (USI) as opposed to SDI. He asked that Keyworth present the briefing to President Reagan. Instead of presenting the brief to the President, Keyworth records show that he passed it to a person by the name of M. Havey. No record of the report was found in the White House files. No reply was ever given to VonKeviczky. In many of President Reagan’s speeches, Reagan promoted his Strategic Defense Initiative (SDI) program. The new program was immediately coined the “Star Wars” defense system by many in the media. The SDI defense shield was, as described by the Reagan White House, a complex set of defensive lasers and missiles intended to shoot down Soviet IBCMs. Although Reagan is given credit for anti-missile defense, and it’s possible use against UFOs, the concepts actually go back many years. In the July-August 1959 NICAP Bulletin a short article was written discussing Air Force plans for a weapon system being developed to shoot down hostile satellites and space vehicles. Because Maj. Gen. B.A. Schriever’s testimony in front of the Senate Space Committee did not indicate specific targets, NICAP concluded “there would be nothing to prevent its use against UFOs”. A few years after MacArthur’s statement, Brig. Gen. John A. McDavid, USAF, Director of Communications-Electronic for the Joint Chiefs of Staff made a similar statement about a possible conflict with extraterrestrials during an Air Force approved speech at Milliken University, Decatur, Illinois. The announcement of the SDI system by Reagan in 1983 was immediately responded to in many sectors of the scientific community as an expensive pie in the sky notion. Scientists declared that it would do nothing but escalate military spending and distrust among the super powers. Outside the Livermore Lab, where many of the systems were being developed, groups demonstrated for an end to the research. We can launch missiles not only over the North Pole, but in the opposite direction, too. As the people say, you expect it to come in the front door, and it gets in the window. . . Global missiles cannot be spotted in due time to prepare any measures against them. In general, the money spent in the United States to create antimissile systems is simply wasted. In the UFO community, the SDI system was viewed as a system set up to destroy not Soviet missiles as Reagan was claiming, but to protect earth from a perceived alien invasion. 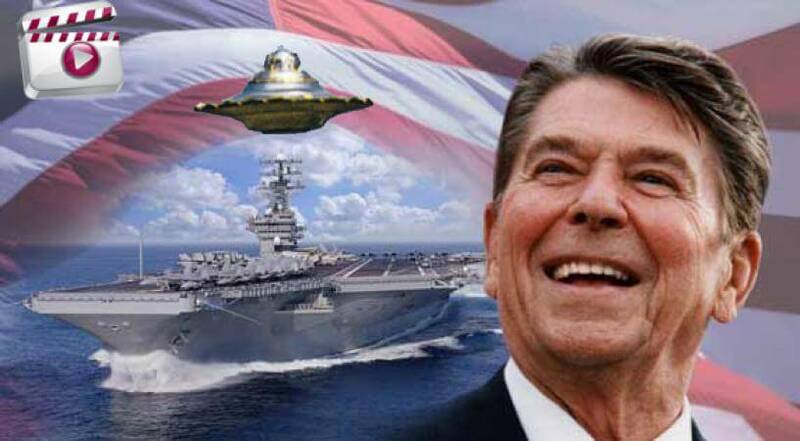 The “alien invasion” remarks that Reagan made after his 1983 announcement of the SDI program, was heralded as further proof that the alien/SDI hypothesis was correct. The concept of aliens from elsewhere attacking the earth was also not an idea that began in the Reagan administration. Even back in early fifties in movies like The Day the Earth Stood Still, images were portrayed of military attacks on the earth by extraterrestrials. – In a June 1995 Bay Area Lecture Dr. Steven Greer announces information leaked to him from the North American Air Defense Command in Colorado shows that the Air Force tracks an average of 500 “fastwalkers” (term used for UFOs) entering the earth atmosphere every year. – New York Times Pulitzer prize winning author Howard Blum reports that NORAD deep-space radars track many UFOs. – Two Aerospace engineers working on the AeroJet’s DSP spy satellite claim UFOs are detected coming from deep space two or three times a month. – Author Whitley Strieber, in his book Breakthrough, stated that he had seen part of a document which revealed that the EG&G Corporation is involved in developing defense weapons against extraterrestrials. – Two further sources have told Greer that rogue units within Unacknowledged Special Access Programs, have directed black budget funds to develop SDI weapons to down UFOs. Further the sources have stated that they have been successful in shoot downs. Special panels got together to try and figure out how they would put together what’s called an architecture or structure of weapons that could actually handle the ballistic missile threat from the Soviet Union . . . In 1984, I was on a panel, a little group of people from the Naval Surface Warfare Center. We went traveling around to various military bases to find out what other people were doing about space . . . should the Naval Surface Warfare Center in particular get involved. That connected me up with the government’s Star Wars architecture study, I guess you could call it. For a period of time, I was working on the various aspects of Star Wars. Well, I can tell you from experience, and I would take lie detector tests on it and swear on a stack of Bibles, a discussion of anything other than Soviet attack never occurred during any of the talks, lectures, discussions, that I participated in . . . They had long range, short range, intermediate range, missiles launched from submarines. That was always the threat discussed, missiles. And all of the satellites, there was a bunch of satellites supposedly up there that would be monitoring the earth. There ARE satellites up there monitoring the earth. All their sensors are directed toward the earth. None of the sensors are directed away. If on the surface, there was no plan to use the Star Wars defense to “attack aliens,” there was, under the surface, evidence among those who were the designers of the Star Wars system that such uses for the system could be part of the future uses for the system. Most of the Star Wars weapons components were being designed by a young group of physicists at the Livermore Lab in Livermore California. One of the brilliant physicists working in the skunk works “Special Projects Office” group headed by Lowell Wood, was physicist Peter Hagelstein. Hagelstein went on to invent a critical element of the Star Wars Defense system – the nuclear X-ray laser. Hagelstein came to the lab when he was only twenty years of age. He did his doctoral dissertation while at the lab which he submitted to MIT in January 1981. His paper was a complex 451 page paper filled with equations and footnotes. It was entitled the “Physics of Short Wavelength Laser Design.” It was “a primer on the theoretics of building a laboratory x-ray laser. and Tom Swift and his Cosmotron Express by V. Appleton. Dr. Steve Greer, as part of his Project Starlight, came across a top level former aerospace executive who claimed that the design of “Star Wars” was to fight aliens rather than Russians. Dr. Greer mentioned him, as one of the 100+ witnesses who would be testifying as part of his proposed disclosure video. This international team working intensely on the disclosure process has been recently joined by a former senior aerospace executive – a person who has been aware since the 1970’s that the Ballistic Missile Defense Program would be used to target extraterrestrial objects in space – even though there is no evidence of any credible threat from these craft. There were other indicators that SDI and extraterrestrials might be connected. Keyworth, the key SDI person in the White House, had a very important tie-in to the world of UFOs. Keyworth had been recommended as the President’s Science Advisor by Dr. Edward Teller, the father of the hydrogen bomb, and also the father of the SDI concept. Dr. Teller led a one man crusade within the White House pushing for SDI. Dr. Edward Teller was also a scientist, who by the late 1980’s, was being named by many researchers as a key figure in the world of UFOs. His connections to UFO stories goes back a long way. Dr. Teller’s first encounter came in the early days of the UFO mystery during the Truman Administration. On February 16, 1948, Dr. Edward Teller, along with Dr. Lincoln La Paz, a University of New Mexico astronomer, was part of a secret 1948 “Conference on Aerial Phenomena” that was held at Los Alamos to discuss the UFO phenomena. The particular interest of the conference was the so-called ‘green fireballs’ which were then being widely reported in the area. This green fireball investigation was also known as “Project Twinkle”. Dr. Teller had commented during the conference that he felt the phenomenon was an electro-optic phenomenon rather than a material phenomena due to the lack of noise. The most dramatic tie-in to the world of UFOs for Teller came in the mid to late 80’s when a story began to surface that the United States government was test flying and back engineeringflying saucers at an area in Nevada known as Area-51. The main person to advance the theory that Area-51 housed flying saucers was Robert Lazar, who claimed to be a physicist from Las Vegas. Lazar claimed to have worked at a spot within area 51 known as S-4. There he claimed he had worked on captured flying saucers, and had seen one of the nine objects there during a test flight outside the underground hanger. Many of the stories Lazar told could not be confirmed, and many items about Lazar’s background seemed to be shaky at best. One item, however, seemed to check out. This item was a June 28, 1982 meeting between Robert Lazar and Dr. Edward Teller, the same person who had recommended Keyworth as Reagan’s top science man. I had built a jet car, and they put it in the local newspaper on the front page. As I walked up to the lecture hall, I noticed Teller was outside sitting on a brick wall reading the front page. I said, ‘Hi, I’m the one you’re reading about there.’ He said, ‘That’s interesting.’ I sat down and had a little talk with him. Then in 1988, when searching for a job, Bob Lazar stated that he sent a copy of his resume to Dr. Edward Teller. Dr. Teller, just as he had recommended Dr. Keyworth for Reagan’s science advisor, appeared to have recommended Lazar for a job inside Area-51. On November 29,88, Teller phoned and gave Lazar a name of someone at EG&G, a company believed to be involved in the flying saucer work. Lazar went to an interview, totally unaware of what the job would entail. Soon he was working at S-4.